We're a professional factory of brake chambers, especially for the disc brake actuators. We're OE factory in China, and export mainly to the Europe market. 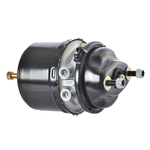 Our disc brake chambers are widely used on trucks, passenger cars, trailers etc. We produce brake chamber under TS16949, and make sure all the products both for OE and after market with high quality. We exhibit on IAA looking for potencial customers.